Make an egg salad sandwich by placing egg salad between two slices of your favorite bread, toast, English muffin or bagel. Excellent Source: choline. Good Source: protein, vitamin D and folate. Reserve 4 center eggs slices for garnish, if desired. Chop remaining eggs. Mix mayonnaise, lemon juice, onion, salt and pepper in medium bowl. Add chopped eggs and celery; mix well. Refrigerate, covered, to blend flavors. 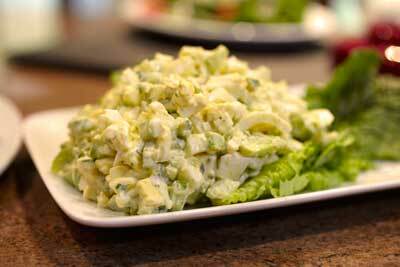 Serve on lettuce leaves; garnish with reserved egg slices.